As CNN and others warned this week that Syrian and Russian forces are closing in on the "last rebel stronghold" in Syria in the country's northwest pocket of Idlib province, US National Security Advisor put Syrian President Bashar al-Assad on notice, saying the United States would respond "very strongly" if pro-government forces use chemical weapons in their campaign to retake Idlib. "We now see plans for the Syrian regime to resume offensive military activities in Idlib province," he said. "We are obviously concerned about the possibility that Assad may use chemical weapons again." Bolton warned, "Just so there's no confusion here, if the Syrian regime uses chemical weapons we will respond very strongly and they really ought to think about this a long time." The "rebel" coalition in control of this major "final holdout" is but the latest incarnation of al-Qaeda, calling itself Hay'at Tahrir al-Sham (HTS) and has held the province, the capital city of which is Idlib city, since a successful Western and Gulf ally sponsored attack on the area in 2015. During Bolton's comments before reporters in Jerusalem, he appeared to boast about prior US airstrikes on Syrian government forces, referencing Tomahawk missile strikes over the past two Aprils — the first of which was in response to sarin gas attack claims made by HTS and the White Helmets in Khan Sheikhoun, which is in Idlib. Considering the al-Qaeda and Islamist coalition in Idlib is now facing imminent total annihilation in the face of overwhelming Syrian Army and Russian air power, it is highly likely that jihadist insurgents and their partners like the White Helmets are already in the process of preparing for some kind of claimed "chemical event". Indeed, Bolton's words on Wednesday of "we will respond very strongly" positively invites just such a scenario. Bolton is currently in Israel to discuss the key issues of Iran and Syria, and further addressed Iran during the press conference. While he noted that "Regime change in Iran is not American policy but what we want is massive change in the regime's behavior," he also said the US supports Israel's recent attacks on Iranian targets within Syria. 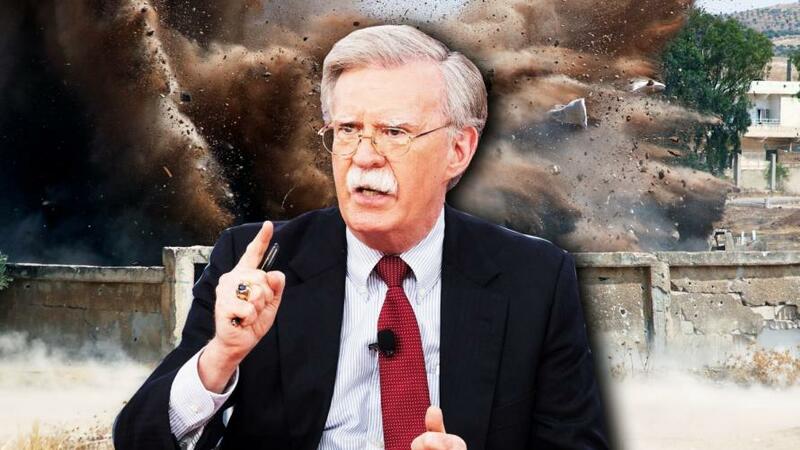 "Every time that Iran has brought missiles or other threatening weapons into Syria in recent months Israel has struck those targets," Bolton said, and added, "I think that's a legitimate act of self-defense on the part of Israel." The other observable pattern on the seven-year long conflict in Syria is this: every time the war seems to have receded from international media attention, with the momentum clearly being with Assad and the Syrian Army, a mass attention-grabbing event or massacre happens to yank the world's (and the White House's) focus right back on Damascus.